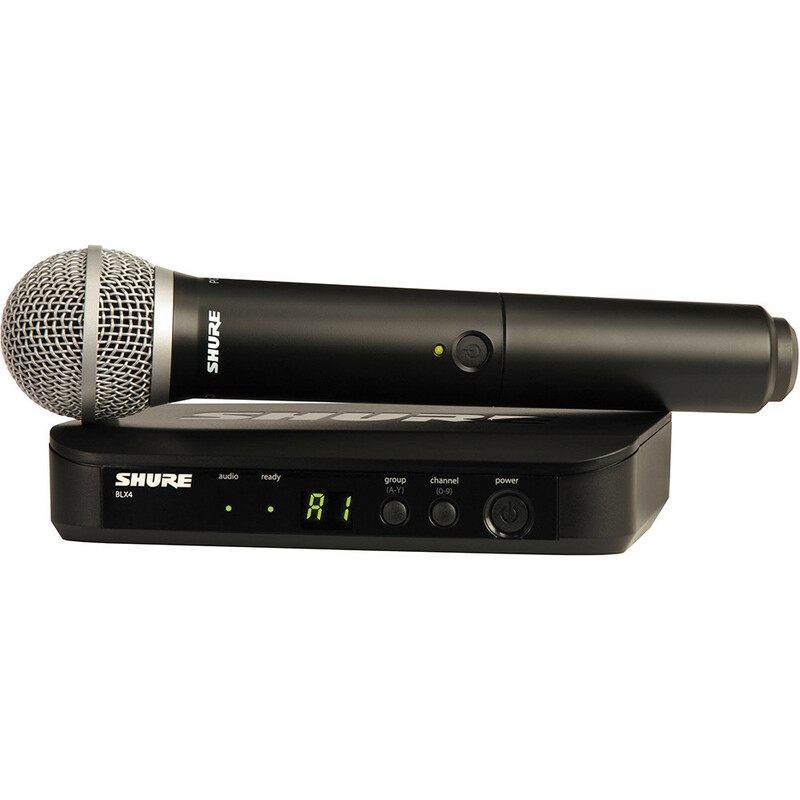 The Shure BLX24 Wireless System With PG58 Mic includes a BLX4 wireless receiver and a BLX2 handheld transmitter with a PG58 microphone. The Shure BLX24 Wireless System With PG58 Mic includes a BLX4 wireless receiver and a BLX2 handheld transmitter with a PG58 microphone. This system is set to Shure’s J10 frequency band between 584 to 608 MHz. The system has up to a 300′ line-of-sight range of operation and is designed for easy setup. The BLX4 receiver’s one-touch QuickScan frequency selection finds the clearest available channel and tunes the unit to it. Its front panel LED display indicates the group and channel it is tuned to, allowing you to set the BXLR2 transmitter to match. A dual-colored LED indicator displays green for normal audio levels and red to alert you if your levels are clipping. The unit has a microprocessor-controlled internal diversity antenna to prevent interference and dropouts. Two included AA batteries provide The BLX2 transmitter with up to 14 hours of operation. You can use up to 12 compatible BLX systems simultaneously per frequency band.